Is it ever ok to paint adjacent or nearby walls in two different colors? What if you need to transition one room to the next? Here are some examples that might jump-start some inspiration. This is a nice, fairly traditional room with hues that compliment each other. The worst thing you can do, in my opinion is have two conflicting colors. I give this one thumb up. From apartmenttherapy, this clearly multi-function room is the perfect place for transitioning colors and corners. I love this grouping of color, particularly the yellow chairs. To me, this is perfect. Purposeful and classic wall color. 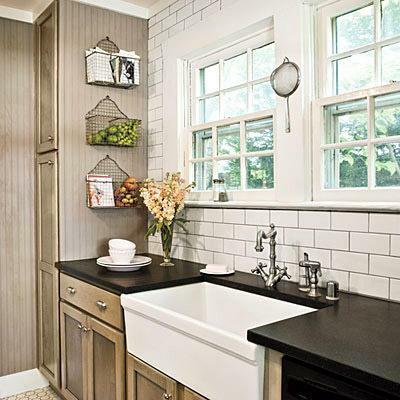 With the white-washed brick/tile look and paneled cabinets, this is definitely making the most out of what you’ve got. This is so fabulous. 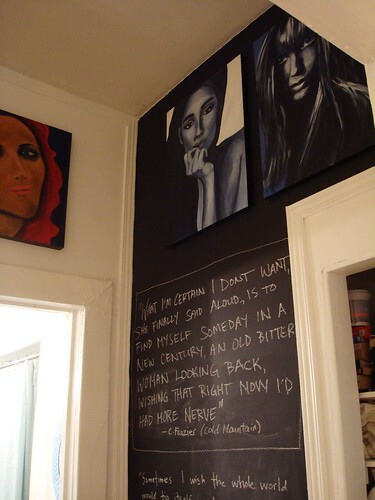 I’ve been seeing this black chalk wall in lots of coffee shops and eateries. Great idea for kids spaces too! I can’t even tell what all is going on here, but this bathroom is a blast! Totally unrelated, but I would feel like quite the important person sitting in this room! This is an interesting use of accent walls and blue patterns. Like? If you have ideas or you have some great transition walls, send them in! I’d love to see what you’ve got! Interesting combinations! My friend lis painted one wall in my apartment pale gray and the others are white. I never would have done it myself but find I really do like it! Sometimes one wall is all it takes to wake up a room a bit. Gray and white is my favorite combo because it frees you up to hang art, color photos or black and whites without a clash issue. Thanks for stopping by!